In the second book of the Shade trilogy from Jeri Smith-Ready, Aura is torn between the two boys who hold her heart—and determined to unravel the secrets of the Shift. Aura’s life is anything but easy. Her boyfriend, Logan, died, and his slides between ghost and shade have left her reeling. Aura knows he needs her now more than ever. She loves Logan, but she can’t deny her connection with the totally supportive, totally gorgeous Zachary. And she’s not sure that she wants to. Let me start off and just say that if I had gotten my hands on this book somehow I would have. Being that I come from a small town and all, my library's YA section is little to nothing. So for most of the books I want to read, I have to request them from other libraries in my county. So for some strange reason, I requested Shade, they had it. When I finished Shade, I almost instantly wanted Shift, but for some strange reason, they didn't have Shift, but the had Shine, the last installment to the series. Like, what is up with that? But I checked it out recently and saw that Shift was there and I nabbed it as fast as I could. I was very surprised by the ending of Shade, and I couldn't wait to read Shift. Shift starts off three months after the crazy ending of Shade. Aura, being the good ex-girlfriend that she is, tries to make Logan as comfortable and not-shade as she can. But it's hard when she has all these feelings for the gorgeous and foreign Zachary Moore because that makes very dead Logan a little jealous. I can't blame her, though. I mean, one dude's dead and the other one is very much alive and Scottish-speaking-like. Speaking of Zachary, I must say this: Why did he not make it 'till the very end of the Crush Tourney?? I mean, this guy is gorgeous all over and cares so much for Aura. He's like this adorable love-struck puppy. I couldn't stand how Aura would do something that would break that little puppy's heart a little. However, I did like how their romantic connection progressed a little more in this book. Me gusta. I must say, there were so many plot twists that I can't help but admire Smith-Ready's writing. I gotta hand it to her; she's got some serious plotting skillz. I got a little bit of that government-in-control, evil-government-eats-kittens-for-breakfast feel, but I was not expecting at least half of the stuff that came around. Answers were given, but more questions arose, which made me all giddy and excited. And on top of all of that, I loved how it all began to tie with Zachary and Aura's research project. 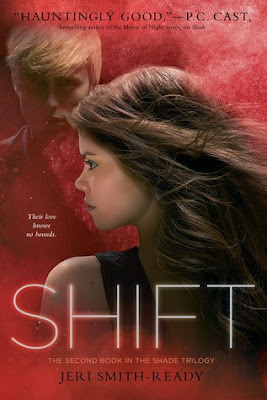 Shift was an expertly written piece that kept me hooked until the very end. I couldn't put it down, and once I did reach the end, I wanted more. The romance was the kind that made my toes curl and a smile to appear on my face. Shift is shrouded in mystery and packed with just the right amount of action. If you are a paranormal fan, or if you like the kinds of books with foreign men and evil governments, I highly suggest this book.